The House That Will Not Stand directed by Lileana Blain-Cruz at the New York Theater Workshop is a lyrical journey through the last days of French Louisiana. Playwright, Marcus Gardley, gives us a lush and evocative script filled with humor, bite and innuendo. New Orleans Creole society developed the custom of Placage, which under French [and Spanish] law allowed a quasi- legal position for inter-racial unions and a legal status for the children. Families of mixed racial heritage held important social and financial positions. It is within this context that Gardley's drama unfolds. Gardley effectively weaves the soft Louisiana accent, French phases, and a modern poetic sensibility into a crisp vehicle. Inspired by tales his great-grand mother told him, the beauty and bitterness of this violently dislodged part of American history comes alive in the characters of seven women. Confronted with the untimely death of the man of the house on the eve of the devastating displacement of French law with American slave law, these seven women each muster their inner resources in a bid for their own freedom. Each character is well developed and resonates with both a keen sense of personal veracity and a meaningful reflection of historic truths. Our scene is the parlor of a grand house in New Orleans. In an expansive room with the requisite high white shutters, flickering chandeliers, and insufferable heat, the body of the deceased is laid out on the table adorned with large white gardenias. Scenic designer, Adam Rigg, and lighting designer, Yi Zhao, recreate this regal, yet forbidding, atmosphere with the use of space and light. The presence of the body of the master provides both backdrop and definition to the actions of the women . How has he died? Has he been murdered? Certainly there are those who would stand to gain by his death, or think they might. Is his ghost still trapped there, is it seeking vengeance on the living? These questions resurface throughout the play and serve as a reminder of the death throes of a way of life. The character of the ruling matriarch—the dead man’s mistress, Beartrice Albans, [Lynda Gravatt] has been compared to Lorca's Dona Alba. However, placed within the cold realities of slavery, her fierce desire to control the fate of her adolescent daughters seems more anguished than malevolent. Indeed she at times does seem quite capable of murder. Yet the magnitude of the evil of the era's realities beget desperate acts. Under American slave law, Beatrice, as a free woman of color, can no longer inherit the mansion she has lived in most of her life. She is not the legal wife of the white man who owned it. He has left it to her in his will, but it must go to his legal wife. She is a woman who has never lived with him nor in the house she now owns. As Beatrice's friend and former rival, La Veuve [Marie Thomas] advises, most of the free people of color have left for France and Beatrice should go too. Placage, the system of extra-legal, interracial marriage had come to an end. All that she has will be brought down with France’s exit. It is a house that cannot stand. Beatrice refuses to leave for France, convinced that she can overcome the coming storm of war and changes. Three daughters, the children of Beatrice, have one more night to position themselves as a placée [the courtesan/mistress] of a wealthy, white French Louisiana man who will pay the for their future. Their mother sees this as condemning them to a form of slavery, and wants their wealth to dictate their choices. She refuses them permission to attend the ball. She does not fully understand that under American law, which will arrive with the dawn, they do not have any manumission papers. They cannot prove themselves to be free born, and they will not get their father’s sizable estate. The choices are limited and the evil that threatens from without is revealed as part of the very fabric of their lives. As they learn Latin, say their prayers and hope for future prospects, their aunt, Marie [Michelle Wilson] a woman driven mad by loneliness, paces the attic. She too has once had an unfulfilled love; a drummer from Congo Square, a man far below her in social standing. These young women try to take fate into their own hands. Delightfully envisioned by [Nadra McClyde] as Agnes, [Julianna Canfield] as Maude Lynn, and [Janiece Abbot-Pratt] as Odette, the yearnings and hopes of adolescent girls are filled with the passion, optimism and immediacy, ever present in the young. Looking for true romance, they plan an adolescent prank to get into the annual masked ball to meet an eligible gentleman. With one girl sworn to secrecy and tied to the bedpost, two escape for an adventurous night. It backfires. The angry and controlling mother threatens murder; the future of the jilted sister is confinement in the house. The role of the house servant, a slave Makeda [Harriet D. Foy], is an electrifying thread that stitches the past, African as well as Native American, to the present dilemma of slavery and the loss of the world as the family had always known it. Her voice as the gossiping spiller of tea, a medium through which the dead man speaks, is powerful. Foy conveys a sense of history and of hope through both dance and drama. She is the slave who is able to buy her freedom and acquire manumission papers. She can then walk out of the house as a free woman. 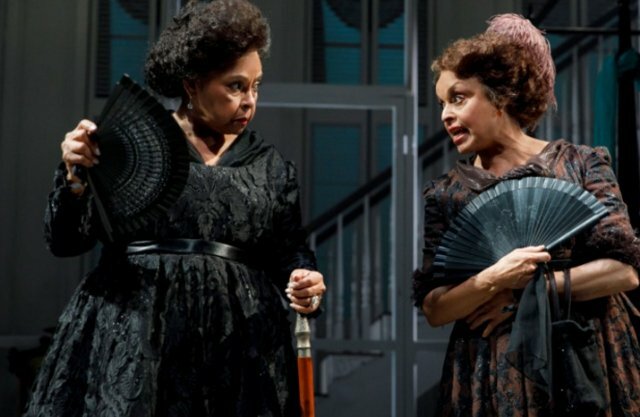 If the playwright intended a bitter/sweet elegy to the foundations of Creole culture, he most certainly has achieved that end in a fabulous evening of theater at the New York Theatre Workshop.